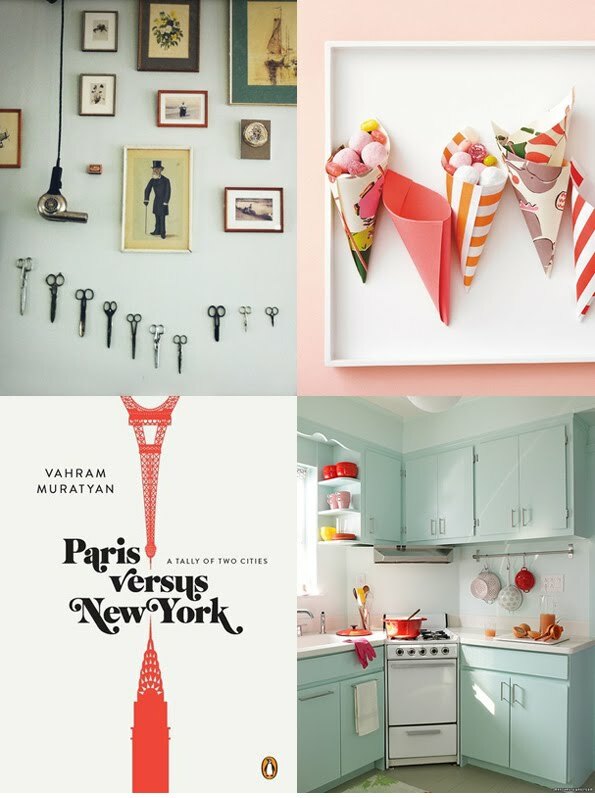 A Cape Town hair salon; paper cones (from a book worth checking out, Modern Paper Crafts); cute & efficient little kitchen (from Blueprint); and the Paris versus New York book cover. Oh that sweet little kitchen reminds me of the studio my husband and I lived in when we first got married! Our Italian kitchen now is more spacious, but every now and then I miss having every dish and appliance within reach as I stood cooking in exactly the same place. Those colorful paper cones are adorable! I ordered the Paris vs. NYC book - can't wait to read it! That little kitchen is the cutest! And my bff made me a bouquet about 7 or 8 years ago out of paper - and those little bouquets remind me of that! I still have it, too! Luvs it all, especially the kitchen!